One of the most highly controversial yet popular diets in the market today is the diet approach made famous by Dr. Robert C. Atkins. The Atkins Nutritional Approach or Atkins Diet has created quite a stir in both the medical and health communities because of its unconventional approach to weight loss. The diet just goes against the norm since it endorses the intake of food that are known to be unhealthy if consumed in large amounts and for long periods of time, while restricting the intake of certain food that are normally considered essential and healthy. Most recently, the Atkins Diet has been cited by one of the most extensive studies ever made on weight loss as more effective than other traditional approaches. We have also been asked by our readers about the Atkins Diet since this diet has remained very popular and still has a large following among dieters who claim about its effectiveness. According to the Atkins Center for Complementary Medicine (a research institute founded by Dr. Robert Atkins), thousands of people have found success with the Atkins Diet. The diet is based on the simple concept that when you eat too many carbohydrates, your body burns some of those for energy but stores the excess as fat. Now if you cut out the carbs and minimize this in your diet, your body shifts to burn fat instead as its primary source of energy. By burning fat instead of carbs, the Atkins Diet claims that you lose weight, you keep the weight off, and you have a healthier life. > Phase 1, Induction: This phase is the most restrictive phase wherein you reduce your high carb, high sugar habit and shift into eating lean sources of protein. The induction phase is a jumpstart phase to get your body to burn fat. This phase is when you see the most significant weight loss. > Phase 2, Ongoing Weight Loss: This phase is when you can increase your carb intake but at levels wherein weight loss could continue. You can add more food variety in this phase. > Phase 3, Pre-Maintenance: This phase is about finding the critical level of carbs you can eat without gaining weight. You can continue to add variety to your meals in this phase and build momentum to lose your last 10 pounds. > Phase 4, Lifetime Maintenance: This is the final phase. This is where you make a commitment to continue your newly acquired habits from the earlier phases and apply them for life. If you find yourself gaining weight, then you have the option to start from any of the previous phases. Below are some of the reasons why the Atkins Diet is still very popular among people who are trying to lose weight. Recent study proves health and weight loss benefits of low carb. A recent two-year study published in the New England Journal of Medicine in July 2008 came to the conclusion that a diet based on low carb intake is effective for weight loss. The study found that a diet based on the Atkins Diet may be an effective alternative to low-fat diets since people on the diet lost more weight than those on the low-fat diet. It is important to note that the study focused on vegetarian sources of fat and protein and avoided foods with trans fat. Actual testimonials of people who have lost weight. We did some further research to find out how people have been faring with the Atkins Diet and found postings of testimonials of people on forums, blogs, and articles about how they have successfully achieved weight loss and better health through this diet, or should we say, lifestyle. Rich in meat protein. 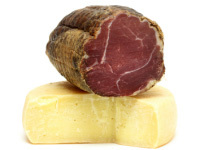 The Atkins Diet advocates eating high protein food, which for most people means eating beef, eggs, bacon, cheese, and other delicious but fat laden food. Most especially in the Induction phase of the diet, there will be more emphasis on protein sources of food as carbs will be highly restricted. 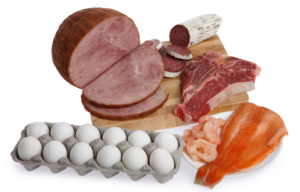 Of course, there are lean choices of protein such as broiled or grilled chicken and fish. For the carnivores out there who are not fond of vegetables and fruits, the Atkins Diet is an easy choice. Restrictive processed carb intake. One practice of the Atkins Diet that we agree in part is restricting your carb intake. By this we mean, restricting the amount of sugary and processed carbs such as cakes, cookies, crackers, bread, and candies. This restriction makes sense to us since these types of food can really make you gain weight. Simple and easy to follow. According to those who have been on the Atkins Diet, this diet program is easy to follow. Although the restrictive phase of the diet may be tough, some Atkins followers swear that once you start seeing results, things get easier. The fact that you are seeing some significant results definitely is a great psychological booster to keep you going with the program. Emphasis on physical activities. The Atkins Diet is actually a lifestyle, which includes lots of physical activities such as exercise, walking, and other physical activities that will get your heart pumping. The Atkins Diet program suggests that you should incorporate physical activity in all phases of the program. We can't argue with the fact that exercise and other forms of physical activities is good for you and are excellent ways to boost your weight loss. Long-term health safety a serious question. The Atkins Diet to this day remains very controversial. Although various studies have shown the effectiveness of weight loss with low carb diets, it is important for us to determine whether these low carb diets were based on lean sources of protein or other fat-laden sources of protein. The Atkins Diet for one, depending on which schools of followers you talk to, can be vague as to whether the diet focuses on lean sources of protein or any type of protein source, regardless of whether they are lean or fat-laden. There are also a lot of questions regarding the long-term effects of the Atkins Diet on the health of those who follow this diet. Researchers and health experts not only question the safety of this diet but are also condemning it as dangerous to follow. 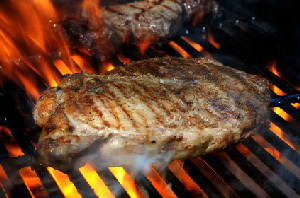 For example, experts warn that the Atkins Diet's emphasis on high-protein, high-fat food can eventually lead to high cholesterol and heart disease. Other serious concerns have been raised by many health experts over whether the Atkins Diet is really healthy since this diet can increase the risks of strokes and kidney and liver problems. Keep in mind that you can lose weight with the Atkins Diet but it does not necessarily mean that it is good for you. Not unless long-term studies prove the safety of the Atkins Diet for overall, long-term health, we think that it is best to stay safe and not take a risk with this diet. Food preparation. Some people find food preparation a problem and would rather use a diet meal delivery service. For those who really would like to try the Atkins Diet without all the guesswork and hassles, check our insider tip below for a solution to this issue. Low emphasis on fruits and vegetables. This diet has a very low emphasis on fruits and vegetables. Fresh fruits and vegetables have consistently been proven to provide great nutritional and health benefits. These should never be neglected and should be part of a balanced weight loss program. Other misconceptions. There are a lot of ongoing misconceptions with the Atkins Diet. According to some followers of the diet, a common misconception is that the Atkins Diet promotes the unhealthy eating of high-protein, high-fat diet. One school of followers say that this is not so and emphasize lean protein sources for their diets. The other school of followers beg to differ and prefer to focus on high-protein, high-fat food. Although Dr. Atkins (who passed away in 2003) tried to clarify this issue in later publications of his book by saying that his plan is not a license to gorge all the steak and bacon that you can put your hands on, the misconceptions about the diet still remain unresolved. Readers who are interested in the Atkins Diet have an option that can save themselves a lot of time. If you would like to get started right away to lose weight through the Atkins Diet without having to prepare Atkins style meals, we suggest that you try the eDiets Atkins Diet meal plan. By doing so, you can jumpstart your weight loss plans right away, have a better idea about how Atkins meals are, and most importantly, enjoy savory Atkins-style meals while losing weight. According to those who have used the eDiets Atkins Diet meal program, this was one of the best decisions that they have ever made since it simplified their lives, helped them remain more focused on their programs, and most of all, helped them lose weight more easily. They mentioned the fact that it was a no brainer way to lose weight since there was no need to watch portion control, count calories, determine what ingredients to use, and freed them of the time for food preparation. Closely adheres to traditional Atkins Diet. eDiets Atkins Diet plan closely adheres to the Atkins Nutritional Approach. Great time saver and very convenient. eDiets Atkins Diet meal delivery was designed with busy people in mind. Just follow the meal plan accordingly to simplify your life. You do not need to plan or prepare your meals since your meals are already pre-cooked. The bottom-line is that the eDiets Atkins Diet meal delivery service can save you lots of time and help you eat healthy to lose weight. Shipped in "Stay Fresh" coolers and delivered directly to your door. eDiet's Atkins Diet meal plans are shipped in "Stay Fresh" insulated coolers with enough dry ice to guarantee its freshness upon delivery. eDiets' Atkins Diet meals are freshly prepared by eDiet's chefs, vacuum-sealed to seal in the freshness and nutrients of the food, and delivered via Fedex. Free diet profile. Before you start on the eDiet Atkins Diet meal plan, you can get a free diet profile right on the eDiets site to better assess your situation and help you prepare your diet program. 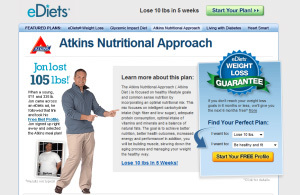 eDiets personalized Atkins Diet plan can help you achieve your weight loss goals much faster and more effectively. Great support community. eDiets has one of the most robust online weight loss communities that you will ever find. Having an online support group is a great way to maintain your motivation as you go through your weight loss journey. Plus ... the community is really very helpful when it comes to questions that you have about the Atkins Diet. You can compare notes and seek advise from those who are using the Atkins Diet meal plan to lose weight. No face-to-face support group. Some people like to have face-to-face meetings with a support group or a weight loss counselor to keep themselves motivated. Unlike Jenny Craig or Nutrisystem, eDiets does not offer this. If you are the type of person who needs an in-person support group or a counselor, and you would like to go with this program, try to find people who are using the eDiets Atkins Diet program in your community or city. Available only in the US. Unfortunately, for those who live outside the United States, eDiets Atkins Diet delivery service does not deliver outside the United States. "Did We Lose Weight with the Atkins Diet?" Note: Most Atkins Diet users have reported losing one to two pounds on average per week. Please be aware that results may vary depending on the individual and other factors. "I started the Atkins way of eating ... and became a non-smoker on May 4th, 2002. I'm 5 foot 5.5 inches tall and my highest weight was 244lbs, but the day I started this way of eating and stopped smoking I weighed in at 229lbs and wore a size 22. I started this web page then to mark my progress and to use as a picture diary of sorts. I reached my goal of 81lbs removed in June 2004. Yep. Just over 2 years. At 149lbs I called goal wearing a size 6 dress and size 8/10 pants. It was incredible!." "During week 41, I reached my original goal of 198 pounds! I have lost one quarter of my original weight. My pants size has gone from a snug 40 inch waist to a loose 36 inch waist." "Over the first 8 years of my heart failure, I lost all the muscle and ballooned up to 207 pounds when I started Atkins. Now into January of 2005, I am down to 184 pounds and have regained a lot of muscle from weight lifting successfully for 2 years. My weight loss is from eating half as much food as I ate before Atkins. With low carb intake, I don't get as hungry and I don't get stupid or tired when not eating much." "Me and a girlfriend did this together about 5 years ago I guess and I lost 30 pounds and she lost 40 ..."
"I have been on Atkins for quite some time. I lost about 35 lbs on the plan and am attempting to lose the last 5-10 stubborn lbs right now. ..."
"... If you truly intend to do Atkins, you absolutely will need the book. FAR too many rules to it. I am not on it, but I was once....I lost a good amount of weight, but couldn't stick to it. I was sick of having meat, meat, meat ALWAYS!!! ..."
"So about two and a half years ago I went on the Atkins diet after my parents had done it and lost a significant amounts, I was skeptical because of course have tried other diets and they failed to do much for me. But this time was different I enjoyed the diet, the bars, drinking plenty of water, going for walks and avoiding certain foods and ended up losing 40 pounds in 4 months ..."
"... Hi, i did the atkins for a few months and lost around 25lbs really fast but i found that i did feel really lazy all the time. I also found that keeping the weight off a real struggle once you start to introduce items back into your diet ..."
"... By February I had lost 70 pounds and was a size 4 for the first time that I could remember! I felt so good, I had energy, I could wear whatever I wanted, and the best part, my husband thought I was gorgeous again. ..."
"... I lost over 70 pounds on Atkins and kept it off for 6 years by following the Atkins maintenance program. Then I quit smoking and went crazy with food - candy, ice cream, french fries... I think that stuff would make you gain weight no matter how you lost it to begin with. I'm now back to a high protein, low carb diet and I've lost 40 lbs. And I'm still not smoking ..."
To continue reading more actual customer feedback on Atkins Diet, Click Here.